CIVL-Cat. II competition, joined by the Austrian and German Paragliding League. Organized by FSC Ikarus Abtenau on behalf of Austrian Paragliding League / Austrian Aeroclub. 2. Austrian Aero Club, Section Para and Hang Gliding in the respective applicable version. a valid pilot license, a FAI sporting license and a third party liability insurance (€ 1.500.000,-) valid in Austria. If you need an third party liavility insurance, you will have the chance to make a contract on the first competition day. The local regulations of the Austrian Aeroclub, the FAI sporting code and the local flight regulations must be accepted. The Online-Registration is open until June 15th, 2019. On June 16th, 2019 the final selection will take place. Selected pilots will receive an e-mail with payment instructions on June 16th. The payment has to be done within 10 days. Not selected pilots will move to the waiting list. Documentation only with GPS, Flymaster - Tracker, GPS-Tracklog. Free WLAN at the headquarter - send us your tracklog with e-mail or upload it to our server. If you are not able to send us your tracklog, we will do the GPS download for you. Please bring you GPS cable. We will charge € 5,- for every day GPS download. Protests may be made 30 minutes after the official competition scoring in written form. Protest fee of € 36 has to be paid at once. 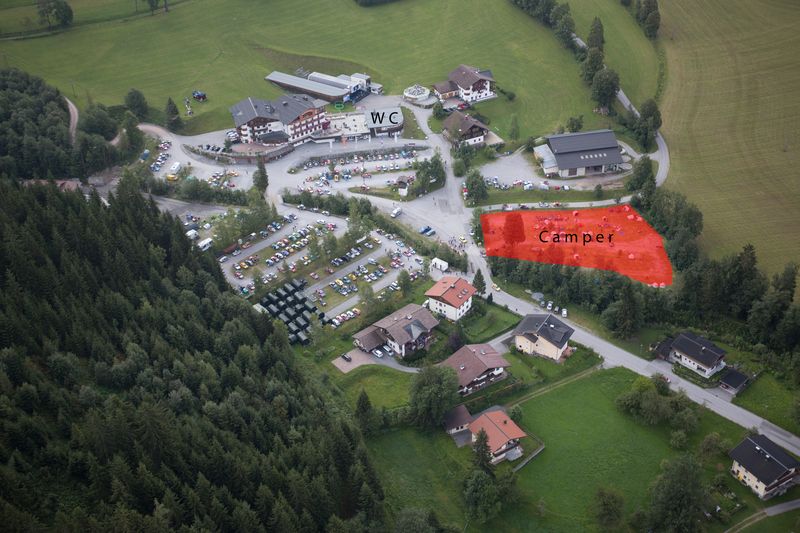 There will be a separate parking for campers (and tents) at the bottom station of the mountain railways. They offer power (bring your own cables) and sanitary facility. You might have to pay some small amount to the owner of the restaurant for the power. Please do not any other parking area for camping! or € 140,- in cash on the first competition day, as long as there are places available. Basically the organizer will not refund the entry fee to nonappearance pilots. In case the competition has to be canceled due to bad weather € 115,- of the entry fee will be refunded, the remaining € 15,- will be used for the expenses of the organizer. Final decision on Tuesday August 13th, 2019, 12:00 a.m. announced at this page. In case of bad weather, the competition could be shortened day by day (e. g.: Announcement on Thursday, 12:00 a.m. that Saturday is canceled). Registration from 7:30 - 09:00 a.m.